While studying in Europe and taking an animation course I decided to create a project that would be reminiscent of my time abroad. In 2012, I went to study at the American University of Rome. While there I took an animation course that introduced me to animating in Adobe Flash. Fascinated with the program, I decided to create my first hand-drawn animation. As I was studying abroad I already took my camera everywhere and as I wanted to include many things Italian in my animation I found myself taking pictures of cars, canals, streets, coffee cups and other items as inspiration for my sketches. Many scenes like the opening image of a canal, originated as images I saw through the viewfinder. From creating a character or sketching out objects I carried around a notebook everywhere to draw preliminary sketches of items I saw around Rome. I drew the visual elements and animated them in Flash. For the narrative I wanted to create something that was simple and relatable. After brainstorming funny situations and characters, I landed on a story about a character that can never quite have a good day, where the audience could relate and simultaneously find humor in his failings. After looking at my surroundings and finding things that could go wrong day-to-day (and a few personal experiences) “A Bad Day from Gaston” was created. As a first time animator, especially for a silent animation, storyboarding was paramount and I filled notebooks, café napkins, and margins of books with sketches of possible scenes before I constructed a formal storyboard. I envisioned the story being told from clip to clip. I pulled from my experience as a film student to construct a “shot list” of angles I wanted to cover and at one point used pieces of paper to order and reorder the “clips” to tell the best narrative. “A Bad Day for Gaston” turned into a two-episode animation. The first being Gaston’s stint as a gondolier and the next his visit to a café. Learning and creating the story drove me to learn more about the nuances of animation. From one episode to another the learning curve is blatant as in episode two the characters are better developed and the scenery more detailed. 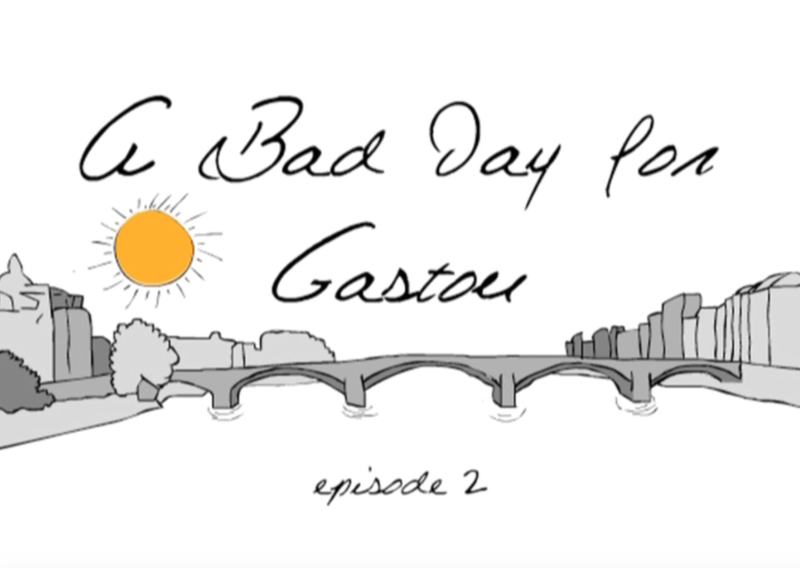 After submitting it to the Visions Festival at American University in 2013, A Bad Day for Gaston: Episode Two won the Best of New Media award.